Whilst doing research on houses we have noticed after looking at plenty of maps and research in the field, that in general boundaries do not change. 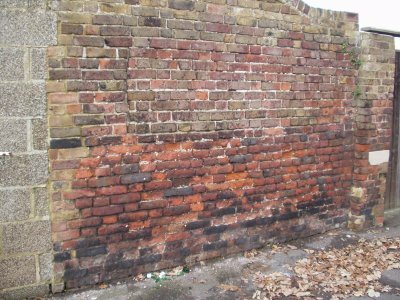 Also if there is a wall on the boundary to a property then it is likely to give you a very good guide to its age. 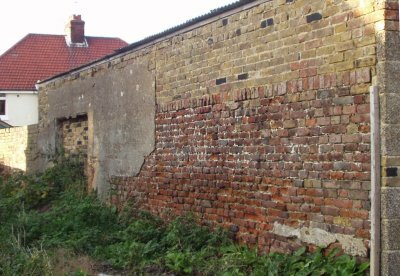 The age of the current property on the site may be young but the boundary wall will give you a clue to what was there before, and how long it has been enclosed. If the wall is obviously old then look on the tithe map. These maps were accurately drawn, for Upper Deal it can be overlaid onto the OS map without much difficulty, showing only minor deviations. 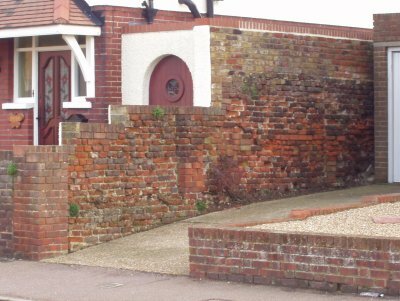 For example the Upper Deal Manor House was demolished about 1965 and the site split up into numerous properties, but today the old boundary wall is still present, to its full height. The photo shows it next to an alley between Manor Road and London Road. Checking on the tithe map, it still runs the full length. 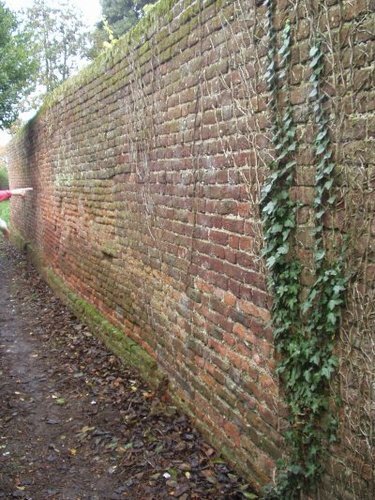 This boundary was there before the Upper Deal House was built and will relate to land boundaries, many of which were still in existance on the tithe map…but relating back to the Feudal system in medieval England, or before. It is surprising the level of detail revealed in some historical records. Here is an extract from the Vestry Minutes for St Leonard's Church dated December 4th 1794 concerning the overflow churchyard: That a wall of the dimensions of eighteen and fourteen inches thick in the foundation and nine inches thick and five feet high above the surface of the earth, be built round the said piece of ground. This churchyard, consecrated 19th June 1795 (Chapman), still exists at the top of Church Path and has recently been planted with Trees of the World by the Deal Society. Here are some pictures of a boundary wall enclosing the Strangers Burial Ground. Research in St Leonard's Church Vestry minutes reveals this was built in 1668, paid for by the parishoners. (Vestry Miniute Oct 30th 1794). This piece of ground in the 20th century has been a nursary, allotments, a paddock amongst other uses and was finally deconsecrated in 1970's. There were no headstones because of no one to pay for them. The buried were mostly mariners washed up on the beach, or from the Naval Hospital up to 1794. When a new Naval Hospital was built in Walmer parish they were not allowed to bury the deceased in Deal parish. Deconsecration was a long process, requiring all the bones to be dug up for reburial in the Deal Corporation Cemetary. The tithe map on this page shows the bedstead representation of the graves near to the Poor House (now St Andrews Church). One end fronting Western Road, added to from half way up. The other end at St Patrick's Road, now built up as part of a garage. The other side of the corner. This has been built on and repaired several times. 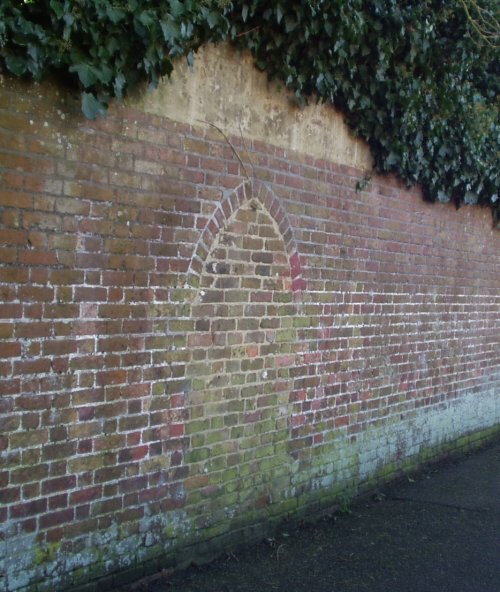 Further evidence in walls reveal bricked up entrances like this rear entrance to Milestone House. It is in line with the central path down the garden to the house. Some boundaries were paths and these over time have become roads. All paths were not boundaries, quite a few went diagonally across fields but still have become roads. Redsull Avenue was the path from Upper Deal direct to the Mill at the top of Mill Hill but it traversed all the fields.